What started as a small hobby during my son's nap-time has become something to which I've become very attached. Doing this blog has helped me to learn so much more about Sunset Park than I would have known just from living here. I hope that the posts I've put up have been informative and helpful to residents of Sunset Park, and I sincerely wish for more information outlets to develop for this neighborhood. While The Brooklyn Eagle often gives time to events and news, we rarely get mentioned in The Brooklyn Paper (still no crime blotter for us?) or other more major papers unless it has to do with violence or prostitution. Even then, we're often ignored. Sunset Park Chronicled, a recent blog started by a CUNY journalism student, is the only place I've found news about the Thanksgiving shooting murder. Anyway, hopefully there will be new blogs to disseminate things like library events, park clean-ups, music in the Rec Center, summer events sponsored by The Friends of Sunset Park, food and toy drives by CB 7 (collecting toys right now! ), and other positive developments. For example, the Friends of Sunset Park and the Rec Center staff are putting on a tree lighting ceremony on Friday night (Read more here). Check out the links on the right side for more Sunset Park weblogs. In the meantime, I'm leaving the site up so that it can be searched for various tidbits of information. Thank you so much to the people who have been helpful and supportive in keeping up this amazing hobby. It has been a pleasure. These days, a lot of people who thought they'd never need assistance, do. McBrooklyn has the information and links on how to apply for food stamps here. And if you're fortunate enough to not worry about your next meal, consider donating cash or food to one of Sunset Park's food pantries. They're doing a great job, but they really need some support. United Methodist (47th and 4th) provided a Thanksgiving meal to many people, and their pantry line is always very long on Thursdays. I met the pastor there last week, and he's a really great guy. Check out this link from May for more information. 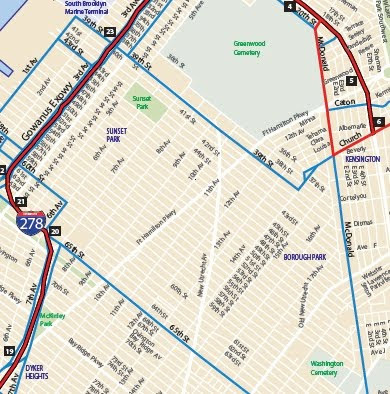 The blue lines are LOCAL truck routes, and the red are THROUGH truck routes. I'm sure the blog author will let people know other ways to submit photographs. It looks wonderful so far, and hopefully it will give Sunset Park some much needed focus.